One of the best parts—if not the best part—of the Grand Theft Auto games is causing mayhem and destruction. The more crashes, explosions, screaming, and police sirens, the better. 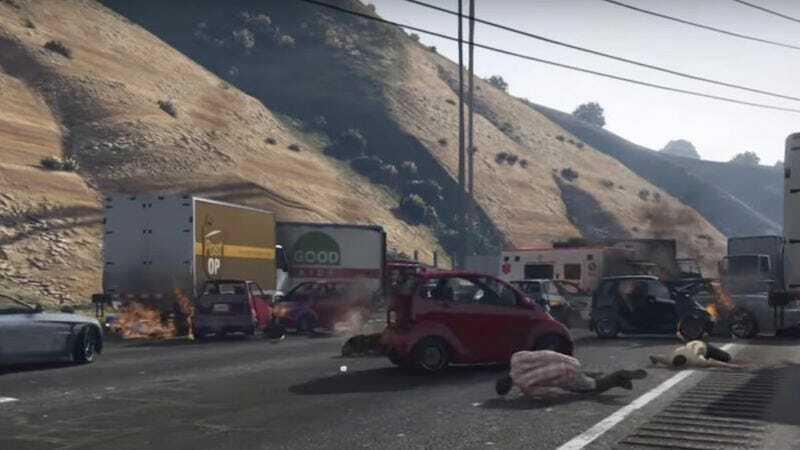 Using the conventions of GTA5 to great effect, YouTube user Hoosker Don’t took that sentiment to heart and set things in motion by crashing head-on to a motorist on the San Andreas freeway. Because car drivers in the game don’t have the sense of real-life people to stop when they come upon an enormous interstate crash, they try to maneuver through the pile-up, contributing to a full five minutes of explosions, people on fire, near-continuous screaming, and the general mayhem so fun to create in Grand Theft Auto games. Even the player observing the destruction can’t escape, as twice he attempts to run through the metal inferno of his own design only to get pelted himself.